That this movie was made in the studio system gives me some hope for the future of Hollywood movies, that it has a star in the title role gives it a wider audience appeal, that he can act is something else entirely. I will not give away any plot points suffice to say that Seven Pounds is a movie told with as little information provided and at only the last possible moment. When the film is over you realize that you quite possibly knew what was happening from the very beginning, but as the main characters motives are never questioned you cannot predict them until it is too late anyway. Will Smith displays quite an emotional range throughout the film and as you begin to learn more about his character the performance is even more impressive, Rosario Dawson also adds dimensionality to a character that could have simply been a sympathy vote. 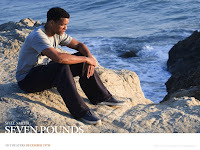 Seven Pounds is certainly not light hearted entertainment, it asks you to have patience with its plotting and character development, it has moments of sadness and a sense of despair, but if you stick with it, the end result is something quite different to the norm.